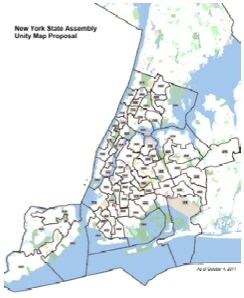 Our Unity Map would make significant advances toward achieving fair representation for the city s communities of color. Asian Americans grew 32% over the past decade to over 1 million, or 13% of the population. Accordingly, the Unity Map achieves four Asian American majority State Assembly districts, compared to only one under current district lines. 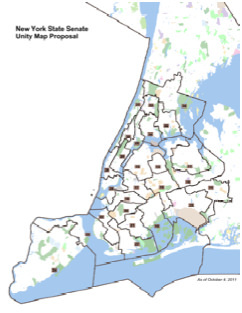 In Queens, where the Asian American community grew 300 times faster than the rest of the borough’s population to almost half a million, the Unity Map creates one majority State Senate district for the neighborhood of Flushing/Bayside. Finally, the Unity Map unites splintered Asian American neighborhoods in Eastern Queens, Sunset Park, Brooklyn, and Manhattan’s Chinatown within Congressional districts. Latinos are New York City’s largest minority group, constituting 29% of the City’s 8.1 million residents. Under the Unity Map, there will be sixteen Latino majority State Assembly districts rather than the current thirteen, seven majority State Senate districts rather than the current five, and three Congressional districts rather than the current one. The Unity Map also preserves the number of Black State Assembly and Congressional districts for the City’s 2.2 million Black residents, who constitute 26% of the City’s total population. Read our new redistricting fact sheets and publications in English and nine Asian languages, and contact AALDEF at 800-966-5946 for more information.